Rookie Vance Worley pitched six effective innings and the Philadelphia Phillies beat the Atlanta Braves 6-3 on a rain-soaked Tuesday night to extend their lead in the NL East to 9 1-2 games. The major league-leading Phillies won their 90th game and reduced their magic number for clinching their fifth straight NL East title to 14 games. They have won 90 games in four consecutive seasons for the first time in franchise history. Worley (11-1) allowed two runs and seven hits, striking out six to earn his ninth straight win. 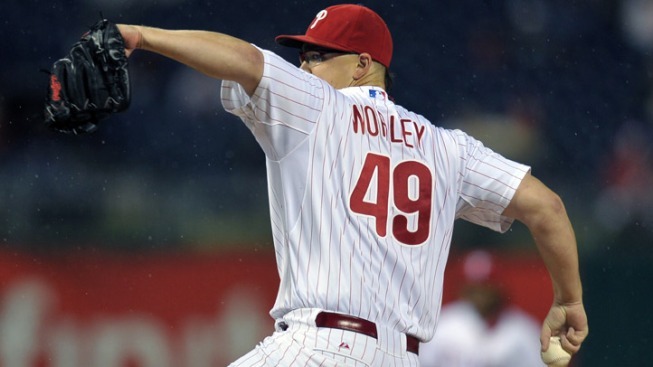 The Phillies have won Worley's last 14 starts. That's the most for a rookie since Cincinnati won 14 consecutive starts by Wayne Simpson in 1970. It's also the most for any Phillies pitcher since the team won 15 straight starts by Steve Carlton in 1972. Tim Hudson (14-9) gave up four runs and six hits in six innings. He was 5-1 in his previous seven starts. Despite losing two straight to the Phillies, the second-place Braves are cruising toward the postseason. They entered with an 8 1-2-game lead over San Francisco and St. Louis in the wild-card race. Heavy showers forced a late start. The game began after a delay of 1 hour, 52 minutes. The teams played without interruption through steady rain once they got going. Only several thousand of the announced crowd of 44,781 were in their seats for the first pitch. It was the 206th straight sellout, including postseason play, at Citizens Bank Park. The Phillies wanted to avoid a rainout because they don't have any days off the rest of the season and are already playing two doubleheaders in the next two weeks. The Braves have a doubleheader in New York on Thursday. Fans holding tickets for this game are being rewarded with free tickets to one of six selected games in 2012. Raul Ibanez had three hits and three RBIs and Chase Utley hit a solo homer to lead Philadelphia's offense. Brad Lidge struck out three in the eighth and Ryan Madson finished for his 28th save in 30 chances. Dan Uggla hit his 33rd homer for Atlanta. After the Braves tied it at 2 in the sixth, the Phillies answered with two runs in the bottom half. Ryan Howard walked to start the inning and Hunter Pence followed with a double. Howard scored the go-ahead run on a wild pitch, diving head first across the plate. Ibanez followed with an RBI double to deep center to make it 4-2. Uggla's RBI groundout off Michael Stutes cut it to 4-3 in the seventh. But the Phillies got two more off Cristhian Martinez in the bottom half. Howard drove in a run with a groundout and Ibanez had an RBI single to extend the lead to 6-3. Hudson retired the first two batters before running into trouble in the first. Utley drove a 2-2 pitch into Philadelphia's bullpen in right-center for his 10th homer. Then Howard beat an overshift with a single through the vacated third-base hole. Hunter Pence followed with a single, and Ibanez looped an RBI single to shallow right-center for a 2-0 lead. Uggla cut it to 2-1 when he connected leading off the fourth. Chipper Jones and Freddie Freeman followed Uggla's shot to right-center with hard-hit singles. But Worley struck out Alex Gonzalez and Jose Constanza and retired Hudson on a grounder to end the threat. The Braves tied it on Gonzalez's sacrifice fly. Uggla walked to start the inning and Jones doubled. After Freeman walked, Gonzalez hit a fly to left to score Uggla.